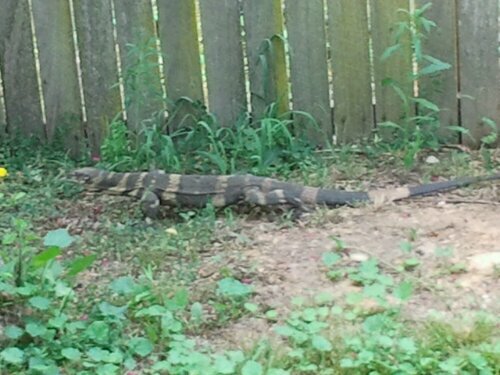 Resident neighbourhood goanna wandering through our backyard. Close up photo courtesy of the G.O. Suddenly my neighbors are looking a little better than they did just moments ago. So cute. Great camouflage outfit too. They are quite striking. We were happy to see it again. How amazing to have something like that wandering around you garden, do they bite? The only lizard I saw on my visit to Oz was quite small in comparison, it was quite stumpy and oval in shape. I can’t remember what it was called, Stumpy rings a bell, but I’m guessing that was its nickname. Thnx. Still another week of holidays. Goanna’s will bite if threatened but more so they will climb the nearest thing… including people, and have very sharp claws. You may have seen a Blue Tongue or Stumpy Tail lizard. I can remember growing believing that old wives tale that if a goanna bit you the bit would come back every year. I don’t know that I have ever seen one. Great subject. It’s entirely possible. I haven’t heard that re goanna bites but have seen it with spider bites. Poisons have energetic properties and memories.